The crafts of colorists, painters and metallizers all consists in reaching tint targets, i.e., colors, surface finish and nuances. The color target is either a benchmark or a Pantone / RAL code. The surface finish target is a gloss gradient, from mat to shiny. The nuances or effects target is a description such as “marbled”, “iridescent”, “pearly”, etc. Tint targets should perfectly match Customer expectations or finish spécifications. The colorist’s expertise lies precisely in understanding finish expectations and in formulating the exact hues and processes in consequence. 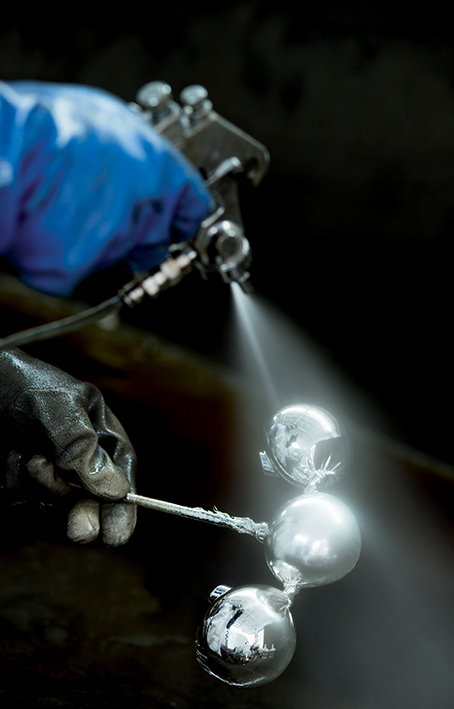 The painter and metallizer roles are to apply these processes meticulously. The MMB team of colorists, painters and metallizers works on ever chaging fine-finish projects by batch or for a single piece. The team is tailored for contributing to the completion of aesthetic models, luxury 3D series, fine automotive prototypes or 3D series. Physical vapor desposition is a sharp metallization process which coats a piece with thin, heat and abrasion resistant tints. The process is efficient and controlled. MMB uses silver instead of aluminium for PVD in order to reach a higher gloss gradient and a pure white hue ; the varnish thereafter is all the more beautiful. The MMB color, paint and metallization team works on all materials otherwise processed at the factory, including : plastics, resins, wood, glass, metals and more. Collaboration with modelling teams is especially narrow to prepare parts’ surfaces appropriately. Color formulation is a critical step toward the end of the production process. The colorist’s “eye” is the best guarantee for reaching project tint objectives. MMB values and fosters this expertise. The painting team is on-site at the MMB factory. They show great time-management skills in applying the final touch to multiple projects at once and in meeting the deadlines. Paintings guns, Tools and accessories. Palette of varnish and varnish hues.